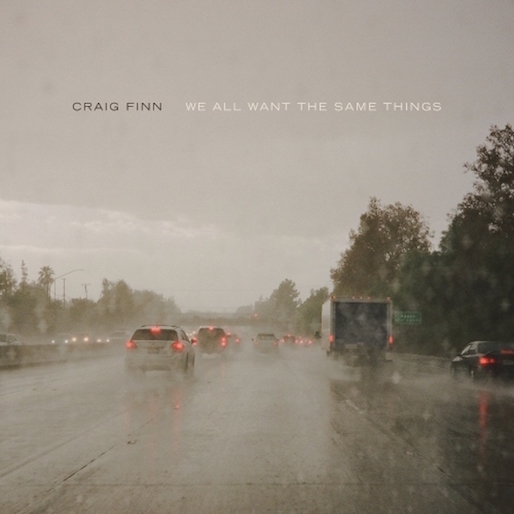 Listening to Craig Finn apart from the Hold Steady took some getting used to. In that band, Tad Kubler’s buoyant guitar riffs hold equal sway with Finn’s lyrics, and hearing the latter without the former seemed incomplete at first. Yet Finn’s eye for detail and deft turns of phrase soon showed his solo material for what it is: another side of a singer with plenty to say. We All Want the Same Things, his third solo LP, features some of his best writing yet. It’s certainly his most self-assured album. Finn’s 2012 solo debut, Clear Heart Full Eyes, was the work of a musician discovering his identity outside the context of his band, and the results were tentative. The follow-up, 2015’s Faith in the Future, was far more confident as he found a trusted collaborator in producer Josh Kaufman, who helped dial in a sound that suited Finn’s tunes. The pair teamed up again on We All Want the Same Things, a skillfully balanced collection of 10 new songs populated with people who are often confronting bygone versions of themselves. All along, Finn has honed a talent for vivid portrayals of people navigating through life, wrong turns and all. “She hung a sleeveless dress up on a sleeved-up lifestyle,” he barked on “Hostile, Mass.,” from the Hold Steady’s 2004 album Almost Killed Me, and it was clear what he was talking about. He’s grown into a subtler writer since then, and his lyrics have become increasingly empathetic, which gives uncommon depth to the people he’s singing about on Same Things. These characters aren’t scene-chasing kids popping amphetamines and slinking through house parties looking “to get touched and rub up against something plush,” as Finn hollered on “Stevie Nix” from the Hold Steady’s 2005 album Separation Sunday. He’s singing here about adults reconciling past decisions with their present circumstances. No surprise, then, that many of these songs are tinged with regret or sometimes simple bewilderment at where things went wrong. There’s a little of each on opener “Jester & June,” which finds half of a couple named Justin and Jane wondering what happened to the youth they spent with heedless, hilarious abandon. “Tangletown” is a marvel of symmetry as Finn traces the intersections between two hard-luck lovers whose lives haven’t gone as planned, while the protagonist on “Preludes”—a song Finn has said is rooted in his own post-college life in the Twin Cities—drifts passively from one dismal circumstance to the next, while an airy flute part flutters through between verses. The showstopper here is “God in Chicago,” a terse, evocative story-song that would have brought Raymond Carver up short. Finn brings together an unlikely pair for a journey, and sets a scene so eloquent and sharply drawn that his lyrics even overshadow the video. It’s arguably the most literary tune he’s ever written. Though Finn sings on the chorus, “God in Chicago” is otherwise a spoken-word track, with spare, sad piano accompanying his voice, sweetened with ghostly backing vocals from Annie Nero. Not all of the album is so subdued. Punchy drums combine with swinging piano and a searing guitar break to help emphasize the misplaced swagger of the main character on “Ninety Bucks,” while a restrained guitar pattern and understated horns on “Rescue Blues” sweep steadily along as Finn’s narrator unexpectedly finds genuine feeling replacing a sense of expediency. There’s still no substitute for the adrenalizing power of the Hold Steady at its best, but the nuance of Finn’s solo songwriting, and the subtler sense of musical adventurism he has come to embrace on his own work, make these songs essential, too.